Does most of your homebrew get kegged or bottled? For most of my brewing the hop shortage isn't too big of a deal, when you are only using .5-1 oz of hops in a batch it just doesn't effect you that much. Luckily when I heard that the shortage might be coming last fall I stocked up on hops from Fresh Hops and Hops Direct, as a result I decided to be a bit wasteful and do an IPA at the end of March. This recipe is a bit strange in that it had no hops in the boil. I added hops at just about every other stage though, to the mash and sparge, first wort, flameout, and dry hop. Normally first wort hops are added as the wort first runs out of the mash tun and into the boil kettle, and they are left in until the end of the boil. What I did was to add them in a muslin bag and then pull them out with tongs at the first sign of the boil. What is the point of all this? The huge amount of hops in the boil for most American IPAs can lend a bit of a vegetal flavor to my palate. By adding hops early the alpha acids are extracted before the boil, and then isomerized by the boil after the hops have been removed. This was also only the second time I have fined a beer with gelatin. It was amazing how quickly the beer went from murky to brilliant, just 24 hours at 45 degrees. According to Vinnie from Russian River the more yeast you are able to get out of suspension before adding the dry hops the more contact they will have with the beer and thus the more effective they will be. 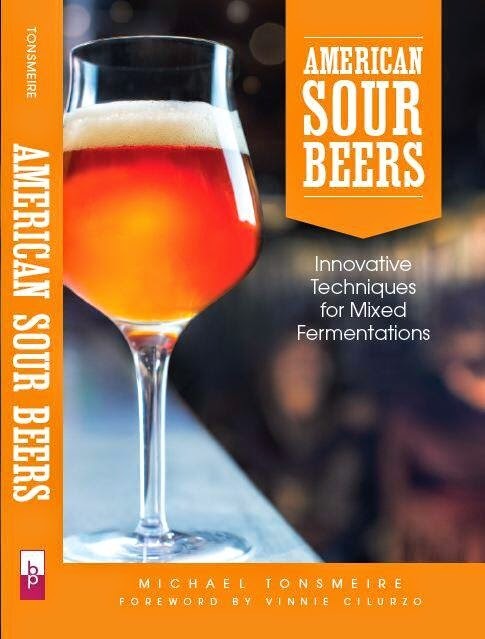 Here is a great pdf from Vinnie on Brew-Monkey where he outlines 10 tips on how to brew better hoppy beers. The malt bill is pretty simple, mostly Golden Promise, with a bit of malted wheat and carapils. I intended to buy "regular" carapils which is very light, around 2L, but instead I accidentally bought Munton's Carapils which is 20L. This mix up isn't a big deal, the beer is still very light in color and sweetness. For hops I used all whole hops, Amarillo and Simcoe, I find them both to be very smooth which further enhances the drinkability I was looking for. 0.05 Oz Irish Moss @15 Min. 2 g gypsum added to filtered DC water for the mash, same for the batch sparge. Collected 6 gallons of 1.044 wort. Took the first wort hops out just as the beer started to boil. Dissolved/hydrated the nutrient and .5 tsp of irish moss in water before adding it to the boil. Gave the beer 45 seconds of oxygen. Pitched half of the starter I made for this and the Smoked Porter. Set freezer to 62 to keep the fermentation temperature in check. Fermentation was active by the next morning. 4/02/08 Upped temperature to 67 to help the fermentation finish off. 4/04/08 Still has a nice thick krausen, only down to 1.020. Hopefully will drop another 6-10 points before it is finished. Solid moderate bitterness and a great hop flavor. 4/10/08 Fermentation seems to be over, dropped temp to 50 in preparation for adding gelatin. 4/11/07 Dissolved a packet of Knox gelatin in 1/4 cup of cold water, then mixed in 1/4 cup of boiling water. Added it to the beer and stirred/swirled gently to distribute, then chilled to 45 in the freezer to encourage precipitation of the yeast. Within 12 hours the beer was noticeably clearer. 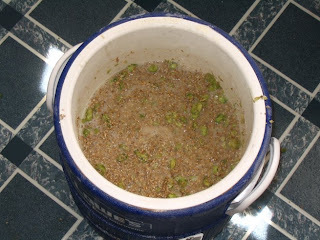 4/12/08 Transferred to secondary and added a marble-weighted hop sock with the dry hops. raised temp to 60 to promote aroma extraction. 4/16/08 Gravity down to 1.012 (81% AA, 6.9% ABV) Bitterness is solid, but not as strong as it could be, however the hop flavor and aroma are terrific. 5/10/08 Scored a disappointing 26 at the SoFB, but I think it turned out as a very hoppy/drinkable IPA. The main complaint from the judges is that it isn't hoppy enough, and that the hops that are there aren't right for an IPA. 5/12/08 Tasted as part of the Alternative Hopping Basic Brewing Radio Episode. Let us know how the beer is after it settles down a bit especially in regards to how the reduced bitterness counteracts its sweetness.